I’ve had the pleasure and opportunity of coaching people from all walks of life, through training and nutrition programs both in person and online for over a decade. With that said, I’ve noticed a great deal of them are often misguided, disinformed, or uneducated when it comes to getting the body fat reduction results they desire. Especially where I’m currently located in Pittsfield, the largest city and the county seat of Berkshire County, Massachusetts. In this post I’m going to supply those of you who want to get leaner, with four common training and nutrition mistakes, as well as solutions to these issues, to help you reduce body fat. A negative energy balance alone, where you take in less calories than you expend, will be responsible for bodyweight reduction, independent of the method used (Strasser et al. 2007) (Hall et al. 2015). For example, whether you choose to eat a high or low carbohydrate diet (Golay et al. 1996) high or low fat diet (Noakes et al. 2005), consume more or less meals (Bellisle et al. 1997) etc. (Leibel et al. 1992) a net negative energy balance will be required for weight loss. However, most people desire to lose body fat, not lean muscle mass, when weight loss is their goal. This is why I explain more reliable ways to track and measure progress, different reasons bodyweight fluctuations occur, and clarify resistance training misconceptions and more in the paragraphs below. Note: I don’t want to move on without saying the energy balance system is interactive and complex: a change in one component can affect one or more other components (Hall et al. 2012). 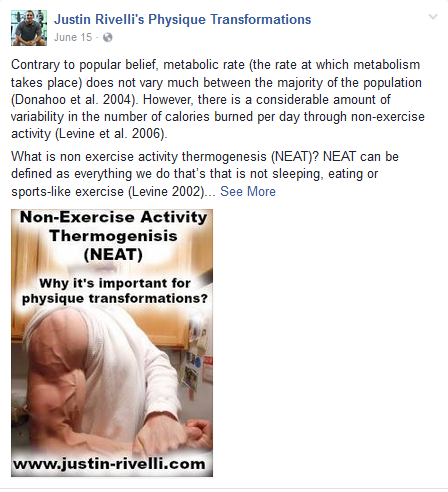 For example, look at my Facebook post below where I explain how nonexercise activity thermogenisis (NEAT) varies between two people of similar size by up to 2000 kcal per day (Levine 2007). Nonetheless, the overall message here is that energy balance (the relationship between energy in (calories consumed) and energy out (amount of energy expended or used by the body) matters when it comes to body fat reduction. The strategies you use to manipulate this (training and diet wise), will vary from person to person, and will depend on things like your primary goals, behaviors, and lifestyle. Before you give, receive, or use advice, what are the circumstances of which you’re basing your judgement off of? For example, if someone asks you, “What foods should I avoid when trying to lose weight?” “How many days of cardio should I perform if I want to get leaner?” or, “Will eating before bed make me gain weight?”, you cannot give them a valid and reliable answer without knowing the rest of their circumstances. Case in point, you can refrain from eating any foods you desire, perform cardio seven days a week, or use any supplement or fat loss trend you come across, but if you do not create an energy deficit or consume less calories than you expend, you’re not going to lose weight (Buchholz, Schoeller 2002). If you’re making decisions, asking questions, or giving advice about body fat reduction without context, your action, inquiry, or input probably isn’t going to matter. Weight loss is different than fat loss. Many people who want to lose weight, often care more about body fat reduction than an arbitrary number the scale spits out. The scale measures your weight, not your fat free mass. This is exactly why I talk about body weight fluctuations and what factors can cause it to rise and fall, that have nothing to do with actual fat loss or fat gain in the next section. However, this doesn’t go without saying that both weight loss and fat loss are generally required for folks to reach their body composition goals. More lean muscle mass at the same body weight = more “muscle tone”. Less lean muscle mass at the same body weight = less “muscle tone”. In other words, when you have more lean muscle mass at the same body weight, you will have less body fat. This also means that if you have less lean muscle mass at the same body weight, you have more body fat. If you’re wondering what progressive overload is, in simple terms it means doing more over time. Whether that is by using more weight for the same number of reps, performing more reps with the same weight, or using more range of motion with all other parameters constant, etc., an increase of stress placed upon the body over time will assure the principle is being applied. Many people who desire body fat reduction are quick to do extra cardio, take more classes, use less rest time, perform higher reps with lighter weight, and/or abandon weight training all together. When you gain strength over time by using heavier loads, you force the muscles to adapt by growing. If you take away those heavier loads when dieting down, you lose the adaptation. Therefore you end up losing more muscle mass than you would have if you stayed lifting heavier weights, in the long run. This is the reason gaining or trying to maintain strength (the primary contributor to muscle growth Shoenfeld 2010) should be executed when on a fat loss diet. When you’re on a fat loss diet, progressive overload is more difficult to implement as you don’t have the extra calories to support things like your training and recovery time. Therefore you can’t train as hard as you normally would with more food. Generally speaking, unless you’re a beginner or untrained lifter (where you will receive the best of both worlds by gaining muscle and strength and losing fat at the same time) the hypocaloric diets required for fat loss may cause you to lose some muscle strength and muscle mass. Intensity has been shown to have a significant impact on muscle hypertrophy and is arguably the most important exercise variable for stimulating muscle growth. Shoenfeld (2010). Shoenfeld (2010), also reports use of high repetitions has generally proven to be inferior to moderate and lower repetition ranges in eliciting increases in muscle growth. Although such high rep training can bring about significant metabolic stress, the load is inadequate to recruit and fatigue the highest threshold motor units. There are also many other added benefits resistance training, besides body composition improvement. I’d also like to add that when resistance training as opposed to “cardio”, you can explore more movement patterns, gain more mobility and flexibility, work on specific problems areas, and much more. If you desire to look “toned” which really means displaying lean body mass or muscle with less body fat, there is no better way when it comes to physical activity than resistance training. 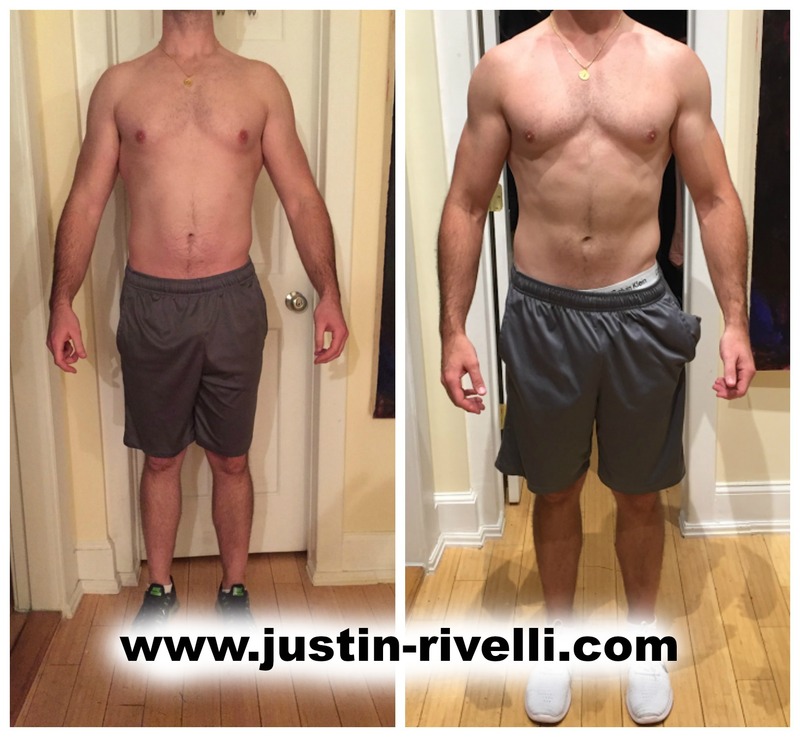 All the clients throughout this article (above and below) are some examples of folks who used resistance training (and the progressive overload principle) in their programs, combined with nutritional changes to get the physique changes shown. The in person and online evaluations I perform, allow me to dive deeply into people’s past current, and possibly future actions, beliefs, and thought processes. This is probably one of my favorite parts of first meeting people, as it allows me to see where their head’s at, and how we can start to solve the issues they can’t seem to themselves. Before I call, skype, or sit down and talk with someone, I have them fill out a sheet. On this sheet one of the many questions I ask is, “how much “cardio” are you currently performing?” Many times, the answer of people who desire body fat reduction as their primary goal is, “not as much as I should”. This tells me that a great number of people have this set of beliefs that traditional cardio is an obligation, a duty, and it’s required for fat loss. However, you’ve already found out from point numbers one and two, this simply isn’t true. Additionally, when it comes to body fat reduction specifically, the energy cost of certain physical activities like “traditional cardio”, don’t elicit as much energy expenditure as many people believe. This isn’t to say that “cardio” doesn’t have other benefits, but that it typically doesn’t “burn” as many calories as most folks might think. It’s also not as necessary for a great deal of people as they feel is true. When it comes to body fat reduction specifically, cardio can help you expend more energy but it will not result in the same physique changes of more lean muscle mass and less body fat, that proper resistance training can. It will also take longer to do so. There are many reasons besides an increase or decrease in body fat, that your bodyweight goes up and down daily, weekly, and monthly you’re probably not aware of. This can be extremely discouraging, or temporarily exciting, which can cause crowds of people to quit the training and nutrition programs they’re following. For instance, an upward shift in fluid balance (not fat gain) can mask your body fat reduction results by causing the scale to rise, and make it appear as if nothing is happening when your program is working as it should. On the other hand, a downward shift in fluid balance (not fat loss) can make it appear as if you’re getting leaner when you may just be dehydrated or have an empty bladder. With that said, I’m going to explain some other ways you can track your fat loss progress, as well as help you understand why bodyweight fluctuations may occur, so it’s less of an issue in the future. Here are some reasons your body weight can go up or down, that has nothing to do with actual fat loss or fat gain. Alcohol consumption: You can wake up weighing less after a night of drinking because of dehydration. A change your body’s electrolyte balance: Can cause an increase or decrease fluid retention. Elevations or declines in cortisol: In excess, cortisol has aldosterone-like effects in the kidney causing water retention. Creatine supplementation: Can increase total body water. Sleep: Moisture lost when breathing. Certain medications, hormones, and other performancing enhancing drugs. Herbal cleanses, colon flushes, and diuretics. A gain or loss of muscle. Menstrual cycle : Can influence body fluid balance at different phases (menstrual, follicular, ovulatory, luteal). As you can see from above, this is why using other methods of tracking progress (besides bodyweight) like taking pictures and girth measurements can also come in handy. To boot, most people can consistently replicate, afford, and perform these whenever necessary. 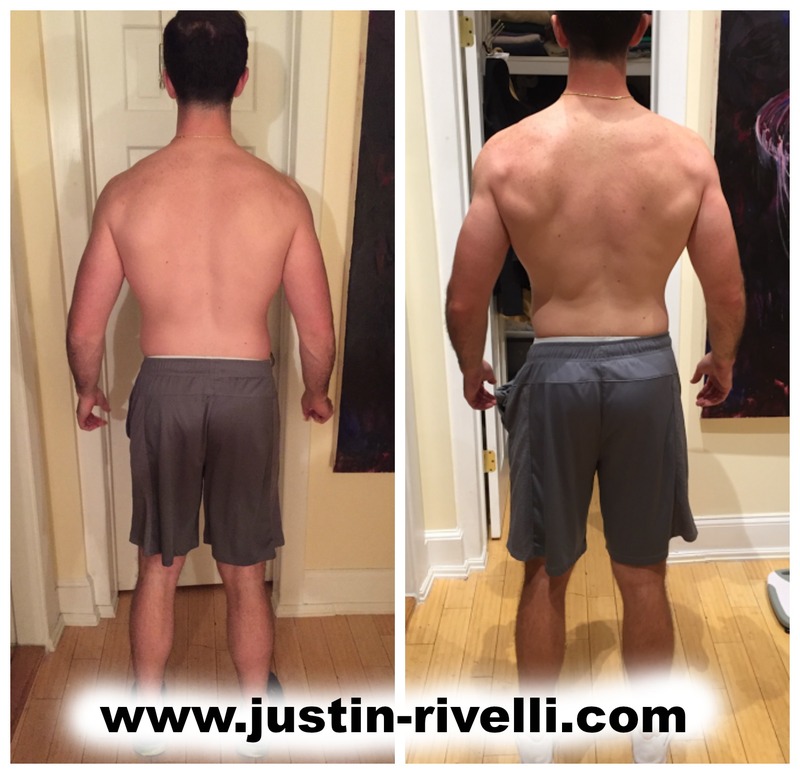 Here are three real life examples that show how disheartening it can be if you only measure progress by the scale, do not understand what your program is supposed to be doing, and why bodyweight fluctuations may occur. Surprisingly, even females as consistent as Elena will sometimes go three, four, or five weeks with no change in bodyweight when “dieting”. Then “all of a sudden” they will drop anywhere from four to five pounds over the course of the fifth and sixth week. This can cause a large number of people to lose confidence, enthusiasm, or give up early, when in the end, progress goes as planned by the end of the month. 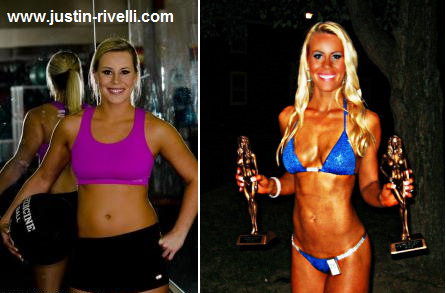 Here is the exact progression of her bodyweight before her last bikini competition so you can see what I mean. This was with no change in calories, macronutrients (carbohydrates, protein, and fats), or anything else training or nutrition related (sets, rest time, cardio, sodium, or fluid intake etc.) over the course of the six weeks. Her weight is listed in pounds. To reiterate my point, I have bolded in red how the scale showed just about the same exact number after four weeks of dieting. You can see how easy it would have been to either alter her diet, increase activity, or even quit over the first four weeks of starting a diet when it wasn’t necessary. If she didn’t take her body weight everyday, and weighed in only once a week, her mindset and data would be skewed. Take a look at the numbered arrows…. Ed’s body weight changed just six times over the course of 14 weeks. With that said, he still lost 11 pounds and even emailed me mentioning it is the most muscular and vascular he has ever been. 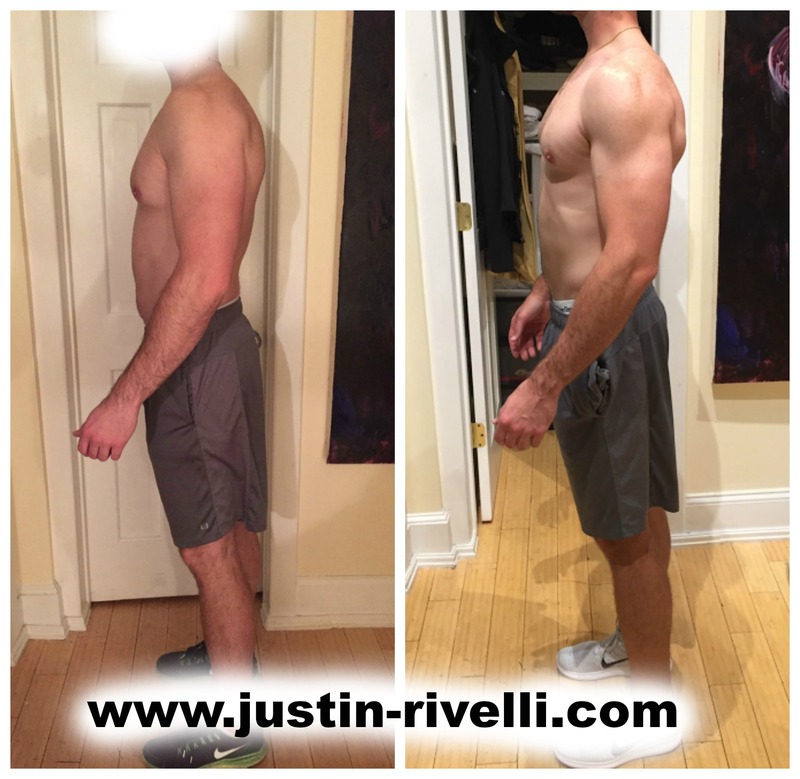 Again, even with men, only weighing in one day a week can cause your bodyweight progress tracking to be skewed and defeating. Amber weighs 130 lbs in all three of the pictures above. 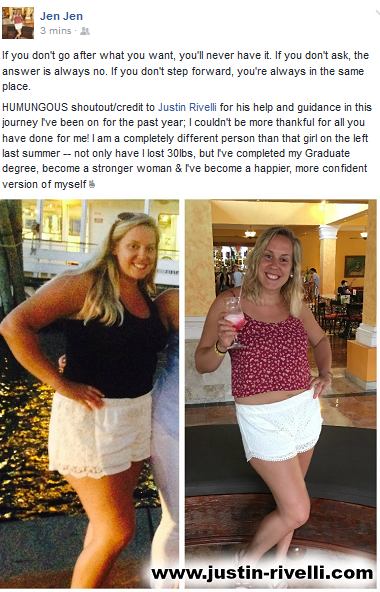 However, if she didn’t capture images for progress, she may not have realized the physical changes (gain of muscle and loss of fat) that took place over the course of one year. Record your bodyweight everyday, upon waking, on an empty stomach. Use the same scale, in the same location, preferably naked. Go to the bathroom first if you can. Over the course of the each week, take the average from your daily bodyweight measurements, so that you’re documenting a seven day moving average. Compare the average of your bodyweight from week one, to the average of your bodyweight from week two and so on. Refer to the excel document under client example number two for an example. The trend of your bodyweight over time, is much more important than a single measurement. Even (Hall et al. 2012) explains body weight over a day, and between days, fluctuates unrelated to changes in energy stores because of changes in hydration and alimentary tract content, which are the primary contributors to the typical 1–2-lb day-to-day fluctuations in weight. Even with everything set up “perfectly” according to your goals, bodyweight loss is often non-linear. As you can see from above, and also from things like the Minnesota Starvation Experiment, a period of activity or decrease in bodyweight, is usually followed by a state of little or no change. Most of you will want to get a flexible tape measure that measures in both inches and centimeters, and that is at least 152 centimeters or 60 inches in length. The official MyoTape tape measure is a great tool for self assessment. Make sure the tape is lying flat on the skin (not clothing), and is horizontal. Take 2-3 measurements, and record the average of the measurements within 1 cm. Take the measurements below on your own, both relaxed and flexed. 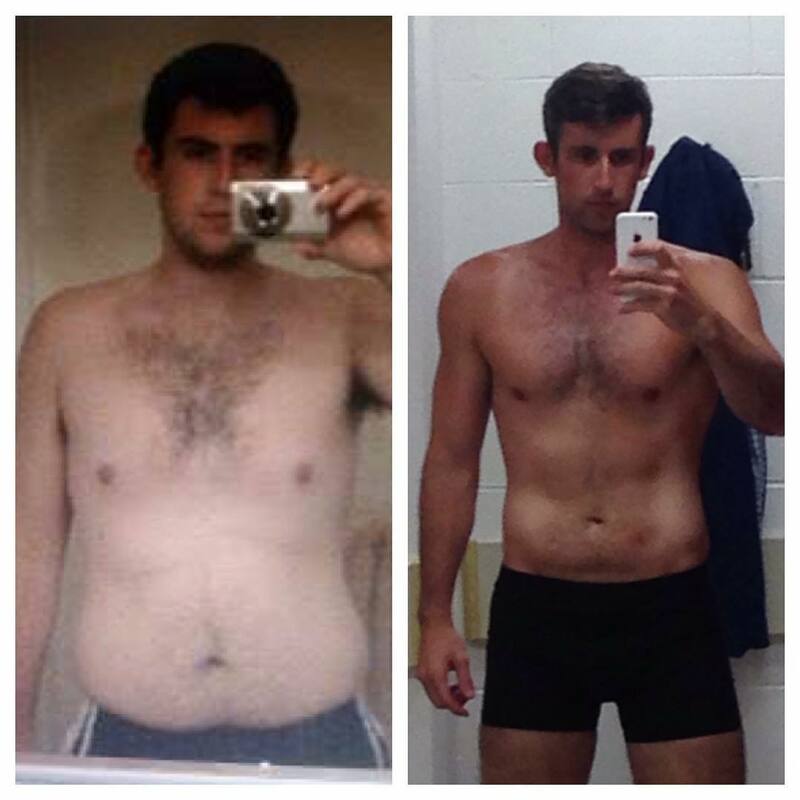 Pictures taken every four to six weeks can be extremely motivating and noteworthy. By having these on hand, you will be able to visually see if any changes are happening. It also gives you another piece of objective information to base your assessments off of. People who do not take these, often regret it. Your mind can play tricks with you, and what you “feel” or see in the mirror can be incorrect or mistaken. Take pictures so you’re not influenced by emotions, opinions, or personal feelings, but rather something that is quantifiable and measurable. Don’t depend on your own personal beliefs. Get real data, and track your results more reliably. Take the photos showing everything from head to toe. Stand against a bare uncluttered wall. Don’t use any filters or added text. Get images from all angles include front, back, and right and left sides. Feel free to include any additional poses you desire. Men wear shorts, women wear a sports bra and shorts or a bikini. Avoid overhead lighting or shadows. Replicate the same conditions each month (light, time of day, distance away from the camera, clothes worn) as much as possible. Visual images of yourself, are the absolute best way to measure progress. They take into account everything whether you know it or not. 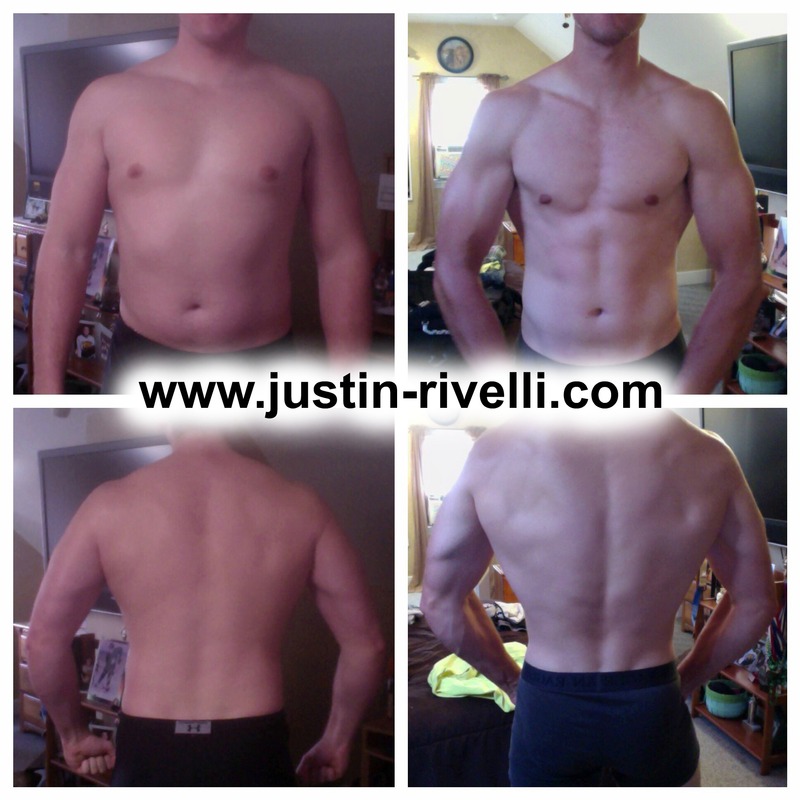 From waist to hip ratios, to body fat percentage, to level of leanness, to lagging muscles and the like. They tell us what we look like, which is usually what we’re most interested in, rather than becoming obsessed with numbers and measurements that may not matter (unless you need to make weight for something). If you’re goal is body fat reduction, and you’re not noticing a change in body weight or girth measurements while adhering to your diet perfectly, pictures will usually help you identify what’s going on. However, by taking them too often, changes in your physique may not be noticeable. I excluded when it would be necessary to make alterations to any programming, because this is very dependent on the person, goal, and circumstances. I will say that I generally review, analyze, and monitor at least three to four weeks of data (if not more) before making any changes, despite the results or lack thereof. This can be annoying to a paying client. Before you set anyone up on a program, you must clarify what you expect to happen, initial calculations (if necessary), and that as a professional you have their best interest at heart. Get on the same page as them so they know where you’re coming from, and so that they are willing to tell you the truth about how compliant they are as well. This will help both of you tremendously as time goes on so you’re not just spinning your wheels. When people know what to anticipate, less things will be a problem later on. While the masses are “trying” what’s popular and in style, the people who get results “implement” the fundamental truths of the goal they desire. There are a countless number of training programs, diets, and supplements that claim to be your body fat reduction “savior”. However, these strategies, concepts, and ideas often point out things you don’t need to know, while failing to provide you with fat loss fundamentals actually required for success. With that said, there are many ways to approach body fat reduction, as opposed to being confined or married to one particular philosophy. This is why in the end, your goals, lifestyle, environment, behaviors, relationships, tolerances, and preferences, along with many other factors is what will determine the approach that is best for you. By using the principles above, you are now informed about not only what actually causes weight loss every time, but also with what is to be expected along the way. If you have any further questions after reading, feel free to post them on my Facebook page here, and I’ll respond to you as soon as possible. 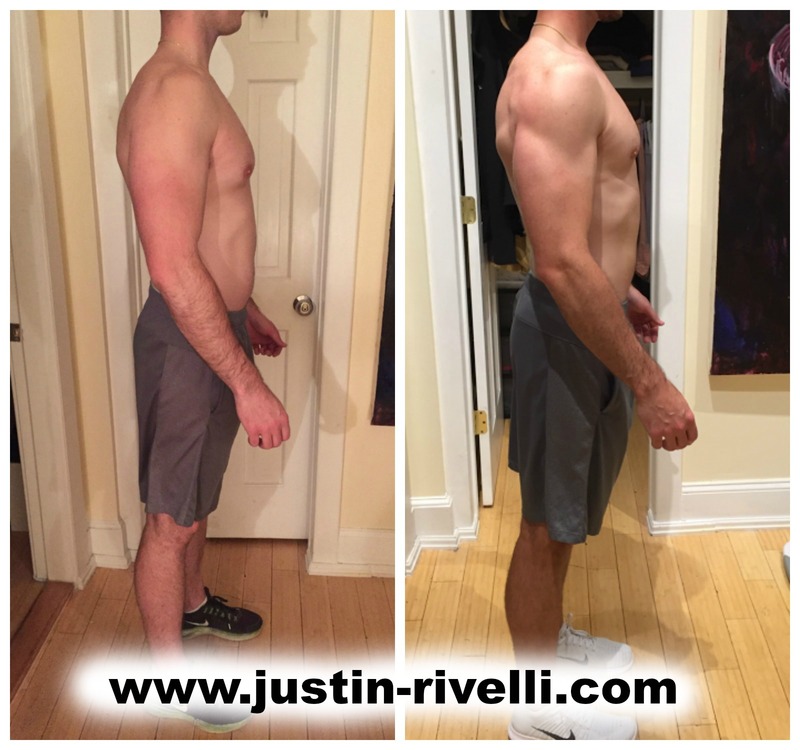 If you want to inquire about customized training and/or nutrition coaching, either online or in person (I’m located in Berkshire County, Ma), you can message me at rivelli.justin@gmail.com. I’d love to hear from you. Thanks for reading!